Etienne Terrus, Elne (acquired from the artist, circa 1905-1906). Jean Planque, Paris (acquired from the Estate of the above, 1956). Mr. and Mrs. Lazarus Phillips, Montreal (acquired from the above, October 1956). Wildenstein & Co., Inc., New York (acquired from the above, 1977). Wildenstein Tokyo Ltd., Tokyo (acquired from the above); sale, Christie's, New York, 19 May 1982, lot 27. Tokyo, The National Museum of Modern Art, Matisse, March-May 1981, p. 169, no. 17 (illustrated; illustrated again in color, p. 41; dated circa 1905). Los Angeles County Museum of Art; New York, The Metropolitan Museum of Art and London, The Royal Academy of Arts, The Fauve Landscape, October 1990-September 1991, p. 314 (illustrated in color, pl. 333; with incorrect medium). Céret, Musée départemental d'art moderne and Cateau-Cambrésis, Musée départemental Matisse, Matisse-Derain: Collioure 1905, un été fauve, June 2005-January 2006, p. 296, no. 140 (illustrated in color, p. 201). Henri Matisse's Paysage à Collioure was painted circa 1905-1906 and therefore dates from the pinnacle of Fauvism. This is clear from the explosive palette of this landscape, which combines yellows and purples as well as the more usual greens. 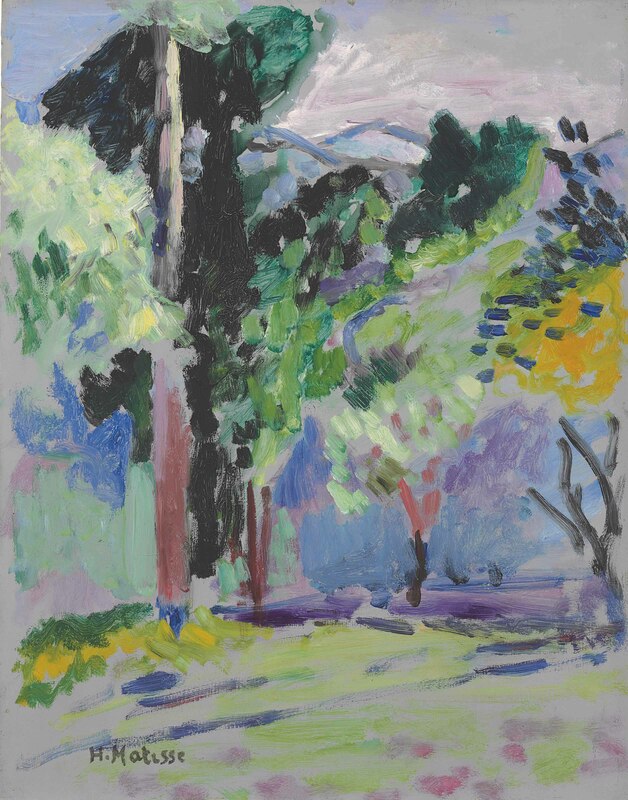 Matisse has created the landscape by using bold brushstrokes of pure color, rather than modulating the tones. Instead of modelling, he has sought out a sense of visual impact and harmony that expresses an emotional dimension as well as a pictorial one. Looking at Paysage à Collioure, one can understand Matisse's statement about his time in Collioure the previous year: "Working before a soul-stirring landscape, all I thought of was making my colours sing, without paying any heed to rules and regulations" (quoted in P. Schneider, Matisse, London, 1984, p. 203). Collioure was the forum for Matisse's boldest artistic experiments, especially during the summers of 1905 and 1906. It was during the first summer in Collioure that Matisse had begun to abandon the Neo-Impressionism he had recently espoused, partly under the guidance of Paul Signac. Now, instead, he was more in the sway of two younger artists: Maurice de Vlaminck and André Derain. In July 1905, Derain would join Matisse in Collioure, and the pair painted together, discussed art together, and forged the path of Fauvism together, capturing that Catalan landscape in their incandescent paintings. As Matisse would recall, looking back on this period, "Fauvism overthrew the tyranny of Divisionism. One cannot live in a house that is too well kept, a house tended by country aunts. One has to go off into the jungle" (quoted in ibid., p. 203). Matisse returned to Collioure in 1906, pushing his Fauve palette to new extremes, constantly probing the power and potential of pure color. This is clear in Paysage à Collioure, with its swirls of yellow and purple in particular. This is a vivid image of the landscape there, further vitalized by the experiences he had recently had during a trip to North Africa. While Matisse was in Collioure, he made friends with one of the local artists, Etienne Terrus, who was the first owner of Paysage à Collioure. Terrus had studied under Alexandre Cabanel, but had returned to his home in the South of France, where he had become associated with the Artistes Roussillonais. As well as forming a strong friendship with Matisse, Terrus was friends with a number of other local artists including Aristide Maillol, who sculpted his bust. Matisse and Terrus spent a great deal of time together, especially in the months before Derain's arrival in Collioure in 1905. Together, they visited fellow artist Daniel de Monfried's home, where they were entranced by the sculptures by Paul Gauguin which he had been sent. Indeed, Matisse and Terrus apparently found it so hard to tear themselves away from these deliberately savage works that they spent the night there, sleeping on the floor (see H. Spurling, The Unknown Matisse: A Life of Henri Matisse, 1869-1908, London, 1998, vol. I, p. 315). The quality that had informed Gauguin's wood carvings can be seen too in the bold treatment of color in Paysage à Collioure, which strips away the gloss and formality that dominated so much art at the time, instead favouring something more direct and more visceral, something that pushes beyond even Gauguin's own landscapes.